Traditionally, caprese salad (named for the island of Capri) is composed of thick slices of tomatoes, thick slices of fresh mozzarella, and fresh basil. I adore that flavor combination, but wanted something with a little less cheese. These baby tomatoes stuffed with just a bite were the perfect solution! 1. Use a sharp paring knife to cut the top 1/4 inch from each cherry tomato, and use the tip of the knife to scoop out the pulp to make a shell. (Save the pulp for sauce or soup, if you wish.) Place the tomatoes cut-side down on paper towels to drain briefly while making the filling. 2. Mash the cream cheese and garlic together in a small bowl with a rubber spatula. Transfer to a 1-quart resealable plastic bag. Snip off a corner of the bag. Use the bag like a pastry bag to pipe the cheese mixture into the cherry tomatoes. 3. Spread the mozzarella cheese in a saucer. 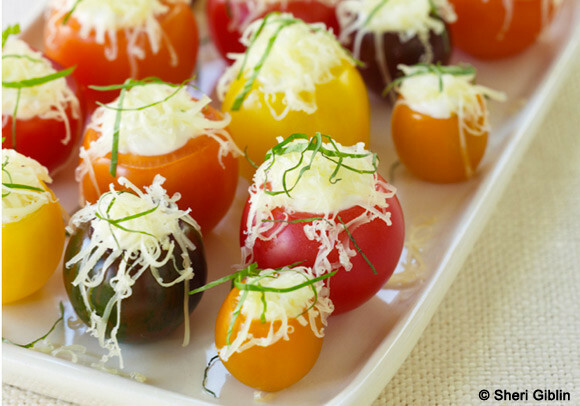 Turn each cherry tomato upside-down and dip the cheese filling into the mozzarella so it sticks. Turn right-side up. Sprinkle the tops of the tomatoes with the basil. Cover and refrigerate for up to 4 hours.